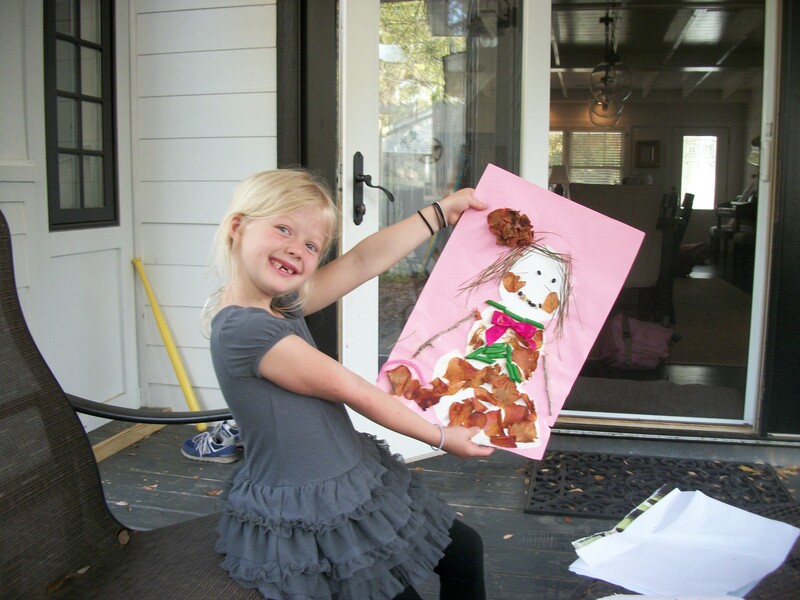 I really love the fact that my four older grandchildren are exposed to learning how to create art. I am so glad that their schools recognize how important creative expression is when it takes the form of art created with the hands, with paint and glue and messiness, not just with the heart and mind, such as is true with words. Talula, though, has been an artist for some time. 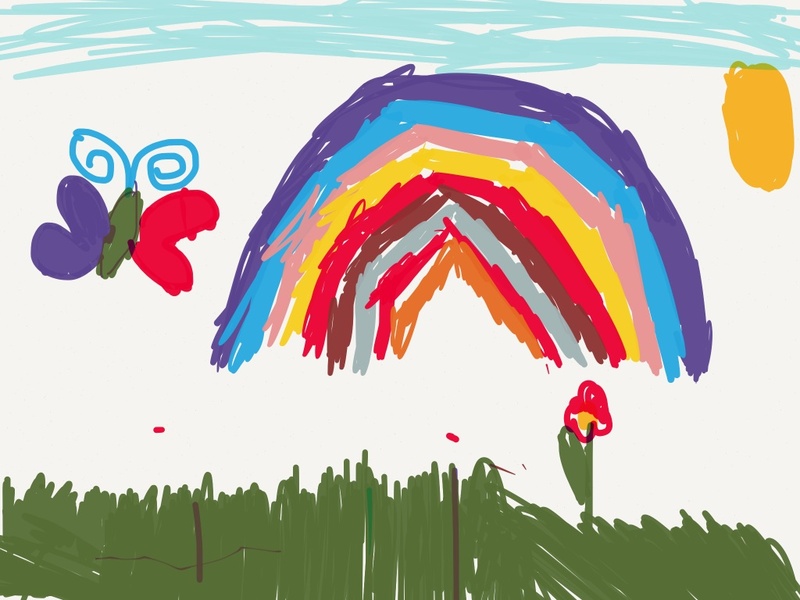 She’ll be seven in September, but for years now she has had the practice of getting up early to draw, color, and create. When she comes to Maine and is “on vacation,” she spends a lot of time making art. I put up a table for her and try to keep the house supplied with paper, crayons, colored pencils, and so forth. They all love to make art, but Talula NEEDS to make art. It’s going to be be really interesting to see where this need to create art takes Talula in the years to come. 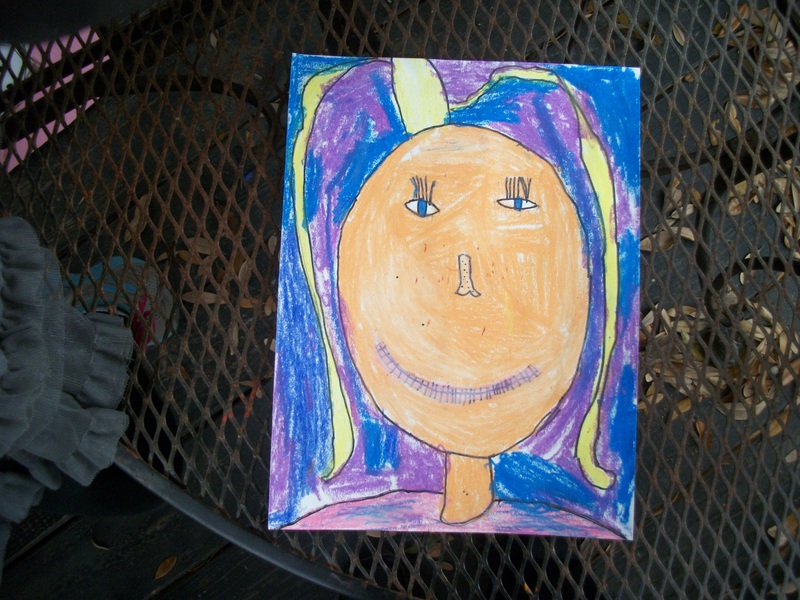 I always ask Talula to show me her recent art when I visit her in Charleston. 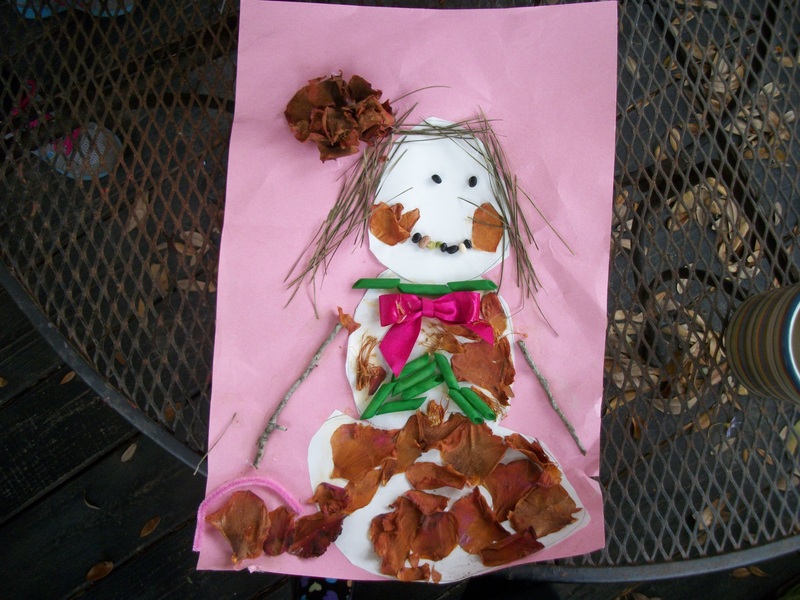 Talula made “the girl” with rose petals, pine straw, sticks, beans, a ribbon, and pasta. This girl has a new form from earlier “girls”–she is stockier and does not have the long neck Talula usually draws. She has two other motifs I’ve seen her doing for the past few years. A girl with a pony-tail hairdo and a colorful rainbow. Here, I think her use of background color–and her patience with putting it all in–is interesting. Here’s the iconic rainbow she does–which I like because, again, it shows she’s not afraid of color. 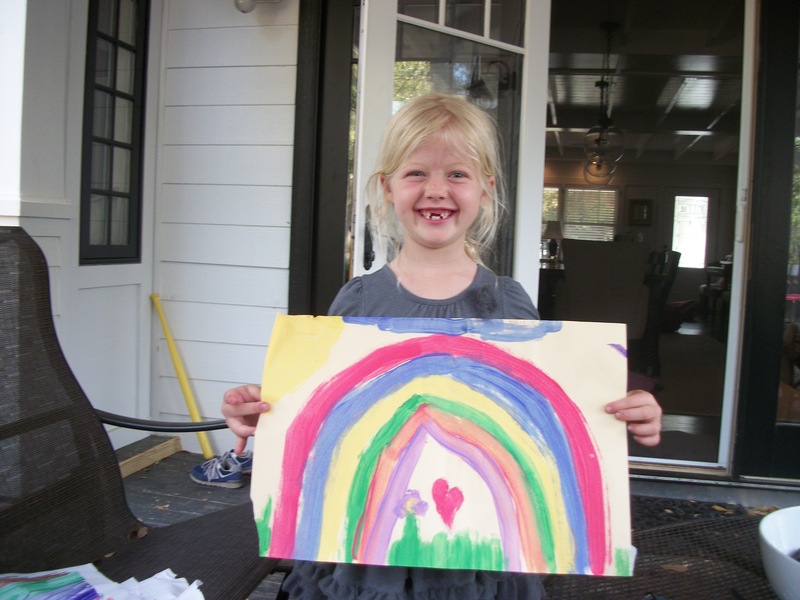 And, the rainbow is about something that she’s imprinted on herself artistically. Like the long-necked girl. Cheers to Talula, An Artist! I hope she will be here again. Love it! I have had an art box (which keeps expanding) for all my budding artists! Some use it more than others – but interesting to see what they create! Bet she will be a quilter like her grandma!!! I’m thinking I will let her design something on the design wall with pre-cut blocks/bricks this summer. I think she’s big enough to reach the foot pedal of the sewing machine. We’ll see. Have you found Bonnie Hunter’s web site yet? Quiltville.com You can get to the blog from there. She has a ton of free patterns and has a lively blog with lots of pictures taken as she travels around the country teaching. She LOVES old machines and often uses a treadle. I learned on a treadle when I was about 10. I’ve learned a lot watching her sew on her Quilt Cam sessions. She’s having one tonight, but the recent ones are archived. It’s just fun!